To begin with, I don't think the book deserves the hype and hate we have been reading about in articles or hearing about on television. I found "Love Wins" to be a great read that compels us to have our hearts right with God and live out our Christianity--not just use it as a ticket to heaven in the future, but to bring some heaven on earth now, by helping humanity with it's pain and suffering and hunger and poverty and illness, etc. 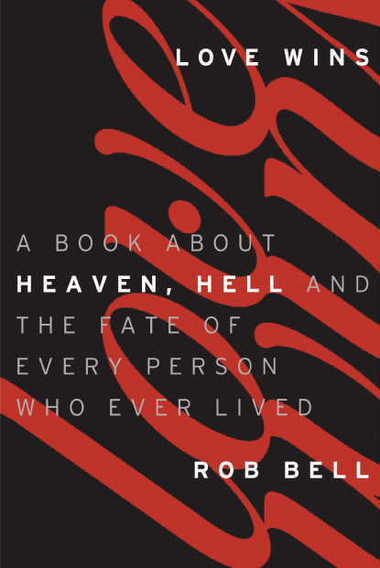 In his books and videos, Rob Bell often asks honest, provocative and probing questions, forcing us to think and read and discuss rather than being spoon fed the answers. He often articulates the questions many were thinking but never expressed. He has a way of making some of us who grew up in the church "rethink" what we've always thought or been taught. He examines what scripture says and what Jesus said and meant and what the backstory was. He provides insightful background information which helps in understanding the context in which Jesus said or did things. Bell explains interpretations of words from the Greek or Hebrew in which the scriptures were written, where there may have been several different words for something we have only one word for. Sometimes these subtle differences can give a fresh perspective, such as his interpretation of the story of the Prodigal Son. There may be a few things in chapters 3 and 4 that you question or don't agree with, but keep reading. He may answer your questions in a later chapter. You may find you agree with him on many more points than you disagree. I actually welcome the opportunity to be shaken up a bit in my thinking, to stretch my mind and be forced to think outside the box of my traditional thought, as long as it is scriptural, of course. Bell uses scripture to back up all of his points throughout this book. In chapter 7, Bell states, "God is love, and to refuse this love moves us away from it, in the other direction, and that will, by very definition, be an increasingly unloving, hellish reality. There are consequences…to reject God's grace, to turn from God's love, to resist God's telling, will lead to misery. It is a form of punishment, all on its own." And in chapter 8 he states, "While we continually find grace waiting to pick us up off the ground after we have fallen, there are realities to our choices. While we may get other opportunities, we won't get the one right in front of us again. Jesus reminds us in a number of ways that it's vitally important we take our choices here and now as seriously as we possibly can because they matter more than we can begin to imagine. Jesus urges us to live like the end is here, now, today." Bell concludes his book with the following: "May you experience this vast, expansive, infinite, indestructible love that has been yours all along. May you discover that this love is as wide as the sky and as small as the cracks in your heart no one else knows about. And may you know, deep in your bones, that love wins.